September 11th, 2011, walking through the middle of the University & José Winn Dixie’s parking lot, I was stopped in my tracks by three distinct sounds – a revving of an engine, followed by a simultaneous thud and a man’s cry. I looked beyond the few rows of cars ahead to see a red sedan speeding through the parking lot and a man lying on the ground. Another couple of stomach-turning sounds – a sudden bang, as the driver then hit a parked car in his haste to flee the scene, and finally, the squealing of set of peeling tires as he sped off, north bound on San José Blvd. It is unfortunate that both the victim and witness’ first instinct is usually to check on the injured, rather than to take that critical glance at the license plate number. Stunned by the show, though there were several people around, none had thought to get that number until it was too late. The victim didn’t seem terribly injured. He got right up, but he was limping a bit. As more people gathered around him and used their cell phones to call the cops, I strode away towards the store to inform the manager, my shock slowly shifting to anger and frustration towards this city. My friend and fellow JBC cofounder, Goliath Flores, once said to me, “People forget just how much power they are wielding when they get behind the wheel of a car.” He is right. Mostly. I tend to believe many are actually well aware of such power. In the 904, not only are they aware, they are stricken drunk on the very idea of it. After the events which have transpired merely within a week – from hit-and-runs, to broken legs, to city bus drivers blatantly lying and pointing fingers at innocent law-abiding cyclists – The JBC will now be focusing great effort in more infrastructure and funding for public education. 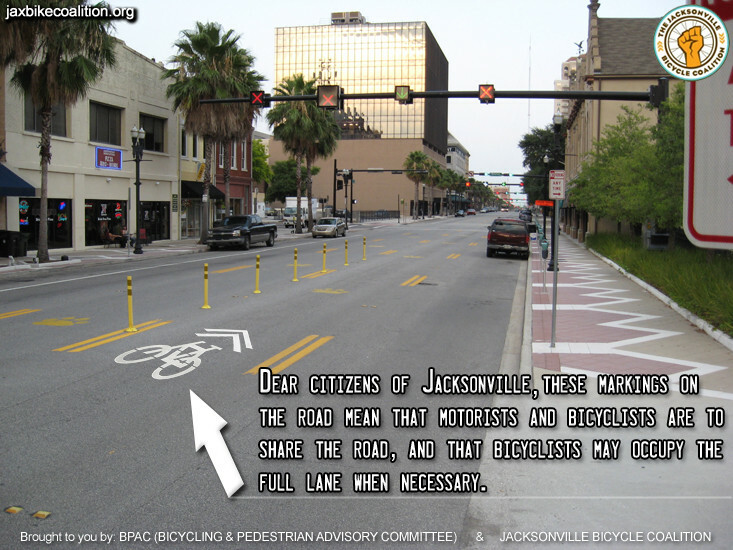 So, dear Jacksonville, I beg the question: Do YOU know what a sharrow is? Because if we of the JBC have anything to do with it, you will know soon enough. ← Five fellow Duval cyclists and friends of the JBC struck by vehicles within three days. Two of them, JBC members.